I love filling my home with different scents depending on the season. With spring upon our heels, my scents of choice are usually floral and beachy scents, however, finding household fragrances that smell good, but aren't overpowering is difficult. Some are so strong that I often get headaches and my senses are overloaded. These types of products are especially difficult to handle for infants, the elderly, and those with allergies or sensitive noses. 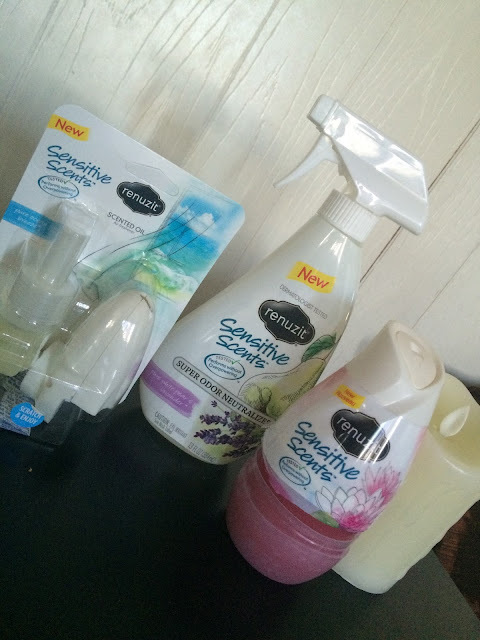 I tried out three of Renuzit's new Sensitive Scents products in each of the available scents. White Pear & Lavender is my favorite and I received that in the oder eliminating spray. I don't smoke, but I have family members who do. I have a tree my mother gave me that smelled really bad of cigarette smoke and no matter how many times I cleaned it, when I walked by, I could still smell the smoke. A few sprays of this odor eliminator and it took care of the problem without choking everyone in the household from the fragrance. It's light enough that you can spray it all over the entire house and not be bothered by a powerful scent. It freshens the air with the relaxing scent of lavender with pear. The Water Blossom & Cucumber is my second favorite scent which I got in the Renuzit cone. I have it sitting on the window in my kitchen where my garbage can is and it fills both my kitchen and dining room with a light water blossom scent. The cucumber is very faint in this (at least for me), but the two scents mix well and can be used in multiple rooms including a baby's room! Pure Ocean Breeze was not one of my favorites. I have this scent in the oil plug in and placed it in my bathroom. Within a few minutes it filled the entire second level of my home with what, to me, smelled like coconut oil. This one was a little strong for me. I had to unplug it. Unplugged I can still slightly smell it, but it's not as strong. I wonder if plugging any of the scents in make them slightly stronger. This scent does come in a cone as well so if you aren't fond of the plug ins, you still have the cone option. Would you like to try out Renuzit's new line of products? One (1) winner will receive three (3) coupons to try out all three products! I bet they all smell great! I think I'd like the White pear & lavender the best!